Our customer required a mechanised waste port hoist to be designed and commissioned for use on Modular Containment Systems (MCS). The system was to be compatible with current hands on size reduction and remote diamond wire cutting operations, and needed to be constructed to comply with relevant UK and European safety standards: CE marked and supplied with full PUWER Certification. Boldman designed and manufactured a special trolley for transporting waste items, and a bespoke platform with which the trolley can be docked. The mechanised post port incorporates our standard linear actuator complete with carriage, linear actuators to raise and lower posting port drum liner, anti-twist cable hoist with load cell attached, electronically switchable permanent magnet, CCTV, accessories and a suitable control system. The control system is built into a purpose-built enclosure with two operator control stations – one inside and one outside the MCS. The equipment underwent a full programme of factory acceptance tests to demonstrate compliance with our customer’s specification and all relevant Health and Safety documentation. Once these tests were completed the assembly went to a temporary installation site where inactive commissioning trials and operator training took place. 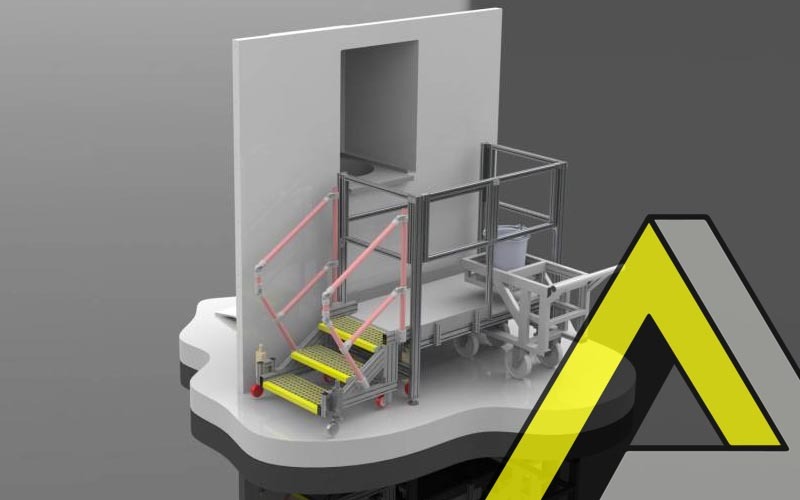 It is now possible for the operator to walk up the steps onto a small platform and with the aid of the mechanised hoist load the bucket into the posting port, delivering enhanced efficiencies and safety. The bespoke hoist is capable of lifting 100kg of waste into the posting port, and design improvements have reduced the risk of work-related upper limb disorders.